New design features corner-mounted, forward angled auger. For the most part, grain carts have looked pretty much alike since they were introduced in the 70s. But Kinze Mfg. is changing that with an all-new design. "One of the key features in aesthetics," Jon Kinzenbaw told his dealers at the unveiling in late July. "It's a vast styling difference. We wanted to get away from the 70s styling." So, Kinze's new grain carts feature a groundbreaking externally mounted, forward angled corner auger. The dual-auger design provides maximum visibility and reach. "You can see it from the cab," declares Kinzenbaw. The corner auger design means it's neatly tucked in under the front of the cart, which also makes it easier to maneuver through gates, etc. 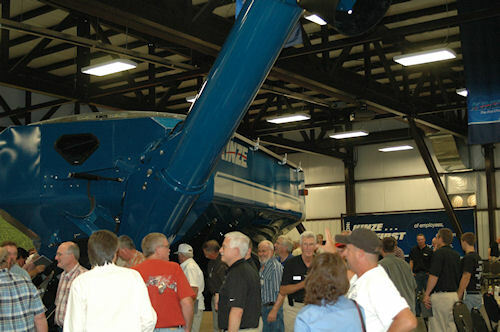 FIRST VIEWING: Kinze dealers got the first look at the new grain carts featuring a corner mounted auger design at a meeting the end of July. The one-piece, horizontal auger moves grain quickly from back to front, he explains. "The vertical corner auger can pivot up to 10 degrees and features an adjustable spout to allow for precise grain unloading and full visibility from the tractor cab." Together, these augers move grain faster than 500 bu. per minute and provide excellent grain clean-out inside the cart, according to the company. The new, larger carts will be available in 900-, 1,100-, 1,300- and 1,500-bushel capacities. The larger capacities will allow for more efficient harvesting, states Kinzenbaw. "The 1300 bushels, for example, is more than what will fit on a semi trailer so the cart also acts as a holding bin," he adds. A wide variety of options are available for tires and tracks to reduce soil compaction. The 1100 and 1300 models feature giant 1100/45R46 compaction-reducing tires. The 900 model comes with 66x43-25 tires. There is a dual 520/85R42 tire option available on the 1100 and 1300 models to further reduce soil compaction. A 36-inch wide tracked undercarriage is available on the 1100, 1300 and 1500 models. A new Steerable Tandem Axle is available for the 1500 model featuring four 66x43-25 tires for extreme load-carrying capability and maneuverability. Kinzenbaw says the sleek, new corners on the carts are welded by large robots to ensure consistency and strength. All Kinze carts feature a durable powder coat finish. Additional options include: electronic scale packages for quick and easy weights, an electric roll tarp to cover and uncover loads quickly and a dual camera option to monitor both the rear of the cart and the unloading auger. The first public viewing of the new Kinze carts was at the 2011 Farm Progress Show in Decatur, Ill. Aug. 29, 30 and Sept. 1.